This printable baseball scorecard let you keep track of your upcoming baseball games. It includes space to record all of the important information about the game, like pitches, runs, and the specifics of each batter’s performance. You’ll love its simplicity. Simply print out the baseball scorecard, fill in the team details, and start keeping score. Download this printable blank scorecard for baseball for free right here. As you can see in the screenshot, this baseball scorecard has room for you to total the number of runs per inning, a player’s individual statistics, and many other important facts about a baseball game. Thanks to this versatile baseball scorecard template for Excel, you’ll never forget the details of a baseball game again. One of our most popular templates, this baseball scorecard is free for you to download and use. No matter which team you’re rooting for, this scorecard makes it easy to jot down the details of the game. 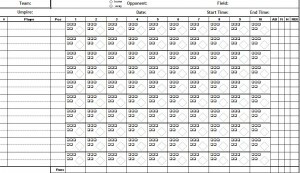 This baseball scorecard Excel template is just one of many that we have available on our website. Feel free to look around, and help us get the word out about our website by posting about this baseball scorecard template on Facebook!